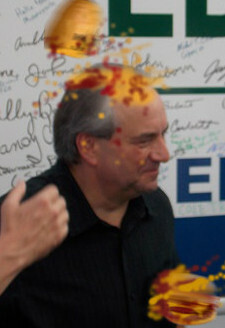 Bill Bolling, chairman of the Victory’s Thousand Fathers Project, holds no elected office, slunk away from his last primary contest, refused to support the statewide party ticket and would be considered unwelcome by many Virginia Republicans were he to publicly self-identify with the GOP. But none of that stops Bolling from attempting to ride the crest of last week’s Republican wave. While Bolling’s argument – that Ed Gillespie’s close finish proves Virginia Republicans should nominate people more like Bolling – conveniently overlooks whatever lesson we might draw from Ken Cuccinelli’s similarly close finish, it’s safe to assume we haven’t heard the last from Bolling … whenever a newspaper has space to fill, or a Democrat needs to strike a “bipartisan” pose, or someone, somewhere, is running low on condiments. 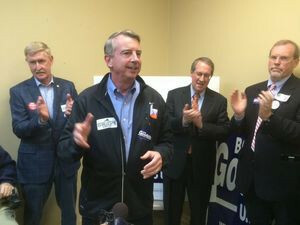 On the final day of campaigning in the Roanoke Valley, Republican U.S. Senate hopeful Ed Gillespie called attention to the voting record of current Virginia senator, Democrat Mark Warner. Gillespie (left) has gained 5 points since early October poll, but Warner holds at 51% of likely voters. A Christopher Newport University (CNU) poll released this morning has incumbent Democrat Senator Mark Warner holding on to a 51% – 44% advantage over Republican Ed Gillespie in the race for Virginia’s U.S. Senate seat. Libertarian Robert Sarvis is favored by 2% of likely voters in the poll conducted Oct. 23-29. Gillespie has gained 5 points, picking up support from undecided voters and previous Sarvis supporters, since the previous CNU poll in early October. 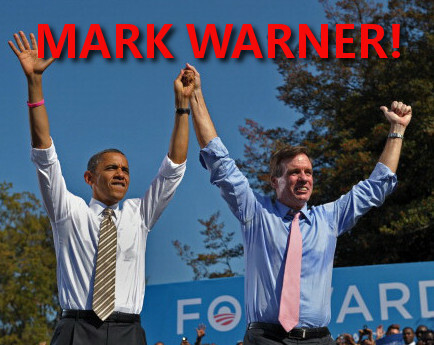 Rubber Stamp: Despite claims of independence and bipartisanship, Democrat Mark Warner is actually the guaranteed lockstep supporter of Barack Obama’s agenda in U.S. Senate. 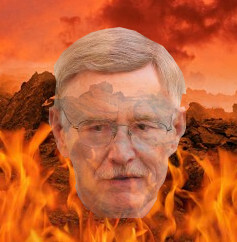 New study reveals Warner’s 100% perfect pro-Obama voting record. In its just-released study of 2014 U.S. Senate voting records, the authoritative Congressional Quarterly ranked Virginia Democrat Mark Warner tops in support for Barack Obama’s agenda, with a stunning 100 percent score. As reported this week in Roll Call, of senators on the ballot in 2014, only an Illinois Democrat matched Warner’s perfect 100 percent record of support for the Obama Administration agenda. Although during campaign season Warner has attempted to paint himself as a “moderate,” his actions tell a far different story, and the numbers do not lie: If there is such a thing, Mark Warner is the “rubber-stamp” vote for Obama in the U.S. Senate. No senator has done more to impose Barack Obama’s agenda on America than Democrat Mark Warner of Virginia. In 2013, Warner supported the Obama agenda in 97% of Senate votes. Warner stumbled egregiously in his recent debate with Republican challenger Ed Gillespie. Already enmeshed in a political bribery scandal, Warner is nevertheless a clever campaigner with a massive budget for television ads to offset his liberal voting record. He still leads in the polls – although Warner’s advantage over the Republican Gillespie has shrunk substantially in recent weeks. Mark Warner, currently a senator from Virginia, was the deciding vote for Obamacare. Philip Puckett, a Democrat and former Virginia state senator, has told federal investigators that Mark Warner, currently representing Virginia in the U.S. Senate, suggested trading a federal judgeship to Puckett’s daughter, which is illegal under U.S. law. Current Senator Mark Warner, who helped put Barack Obama in office, is attempting to defend his own seat this year. Republican challenger Ed Gillespie will hold his final debate with Mark Warner tonight in Richmond, Virginia, at 7:00 pm Eastern time. The debate will air on C-SPAN, and in Richmond on WCVE PBS and WTVR-TV, CBS 6. Warner currently holds one of Virginia’s seats in the U.S. Senate, but Gillespie hopes to take that office after the November elections. Click here to read more about tonight’s debate ….